I really loved this one. I found it to be very sweet. 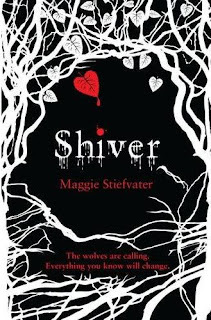 I really loved the way in which Maggie Stiefvater told this story. Large chunks of it I just wanted to read out loud just for the sake of hearing the words spoken. I found Grace and Sam to be very likeable and believable, though Sam was definately the more developed character of the two. I felt like the cold weather was a character in itself and I almost felt chilly reading the book. Shiver tells the story of Grace and Sam in alternate chapters. After Grace is attacked by wolves and then saved by one in particular, she's become a little obsessed about the wolves. Sam spends the warmer months as a human and the colder months as a wolf until an accident changes him back into a human and he turns to Grace for help. Time is not on their side, as it's getting colder and colder and Sam will not be able to stay human for long. I picked up this book partly because of the good reviews I'd been reading on blogs, partly because I love a good paranormal romance, and partly because that cover is so darn pretty. I read it in as close as one sitting as I could and I finished it with a smile on my face. I'd like to say that I had problems with the storyline as I was reading it... that Grace and Sam had this intense relationship with each other with no basis that was explained properly, that Grace had no other hobbies or interests besides obsessing over a boy.. but I didn't. None of those things bothered me until after I'd finished the story and I only thought of them as I sat down to write this review. I was just swept away by the story and the romance between Grace and Sam. There were so many cute little moments that they shared together that was balanced nicely with the cold weather and bleak circumstances. I just loved this book. I read it on holiday and thought it was fabulous. Hope to review later this week or next week. I enjoyed this book, too. I picked it up because of the cover as well, although the book I read had a slightly difference image. I just picked up my first book by this author. I am looking forward to it. I just picked this up from the library the other day. I'm looking forward to it.